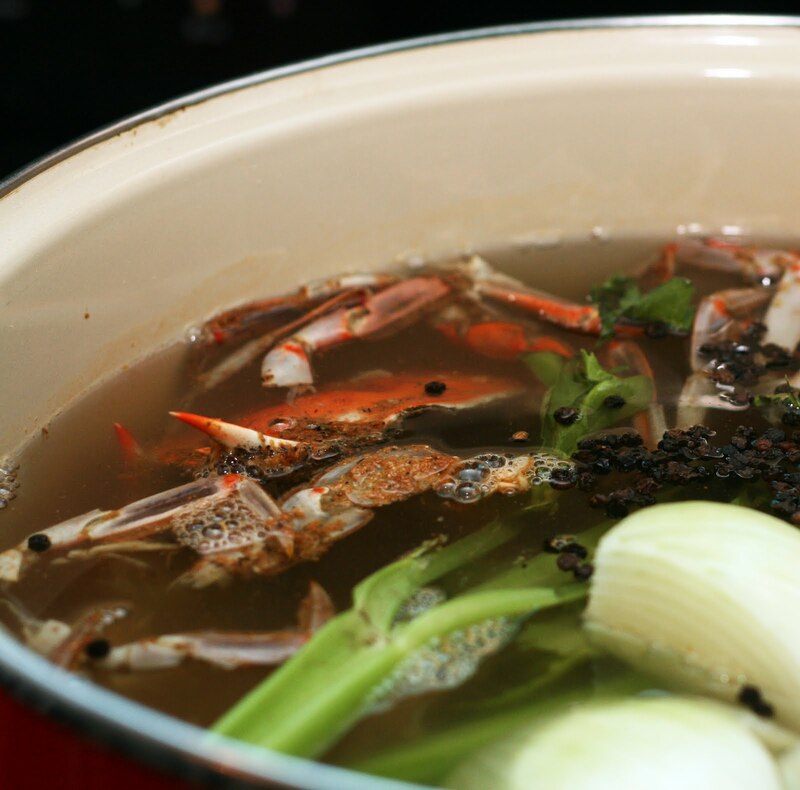 Place the crab shells and the vegetables in a large (8-10 quart) stock pot. Add water until the pot is nearly filled. After about 4 hours (longer if you used more water and a bigger pot), and the liquid has reduced, strain into a large bowl. If you want it super clear strain through a paper towel or cheese cloth lined colander. Cool immediately by placing the bowl in an ice filled sink. Refrigerate overnight, then skim off any scum that rose to the surface. 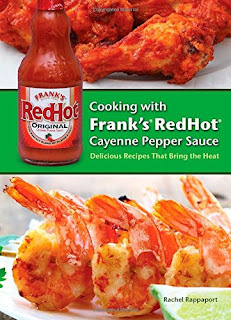 Package in air tight containers and refrigerate it up to 12 days, freezer bags to freeze up to one year or pressure can. *I picked/ate the crabs one day and then refrigerated the shells overnight in gallon bags. I also threw in any legs/claws that did not get eaten. They, of course, were pretty well coated in Old Bay. Normally when having a crab feast (see how to steam blue crabs here and how to pick them, here) you line the picnic table with newspaper and just toss the whole lot out but for this, I saved the shells overnight in a few ziplock bags and made this rich stock the next day. I don't think it is that common to make stock out of old crab shells but crabs are tasty and expensive and it seems a waste not to. This stock will be great in crab soup or in any seafood recipe that calls for stock or broth. I also think it would be wonderful used instead of water to make rice. Place all ingredients in a medium bowl. Mix until all ingredients are fully incorporated. Form into 4 flat patties. Heat a couple of tablespoons of canola oil in a skillet. 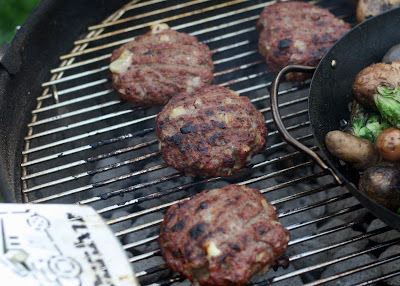 Pan fry each patty for 3 minutes on each side or until crisp, golden and warm all the way through. School is just about back in session here in Baltimore and it got me thinking about my elementary school days. 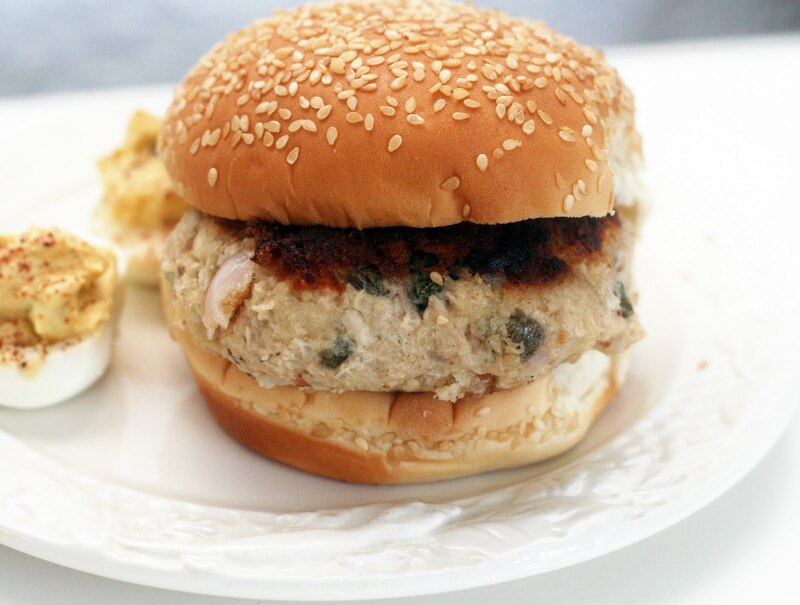 We used to have tuna burgers for dinner or lunch occasionally I was a kid and I thought it would be fun to revisit them using slightly more exciting ingredients. These are much more flavorful than what I ate back in the '80s but I think just as easy. I also switched up the name to "croquettes" to fancy it up a bit; apparently my husband's family called them this so I'm adopting it. Bring the vinegar and salt to a boil. Prep the lids/jars. 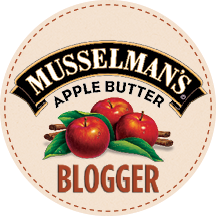 Evenly divide all of the ingredients between 2 pint jars Pour in the vinegar mixture. Close the jars leaving 1/2 inch headspace and process for 10 minutes in a hot water bath. Allow to sit 2 weeks before eating. 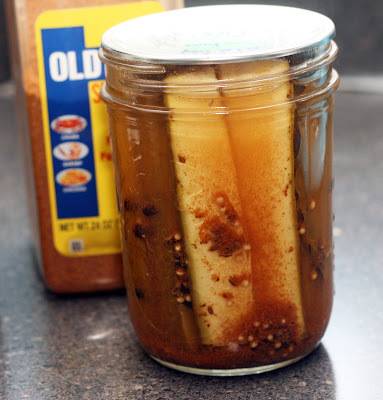 I came up with the idea for making this after throughly enjoying the cloves of garlic I found at the bottom of the jar of many of my homemade pickles. 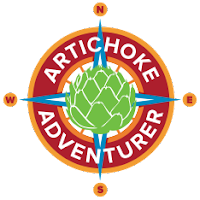 They were always so mildly garlic-y yet pickle-y and flavorful. I could only imagine how great a whole jar of them would be! I wanted to make a small batch because many, many cloves can fit into a pint jar and I knew that once opened they would be fine in the fridge for a long time. I can't wait to have them in salads, burgers, in marinades, well, any where I'd normally put garlic. Yum! Note: Peeling that much garlic can be a daunting task. 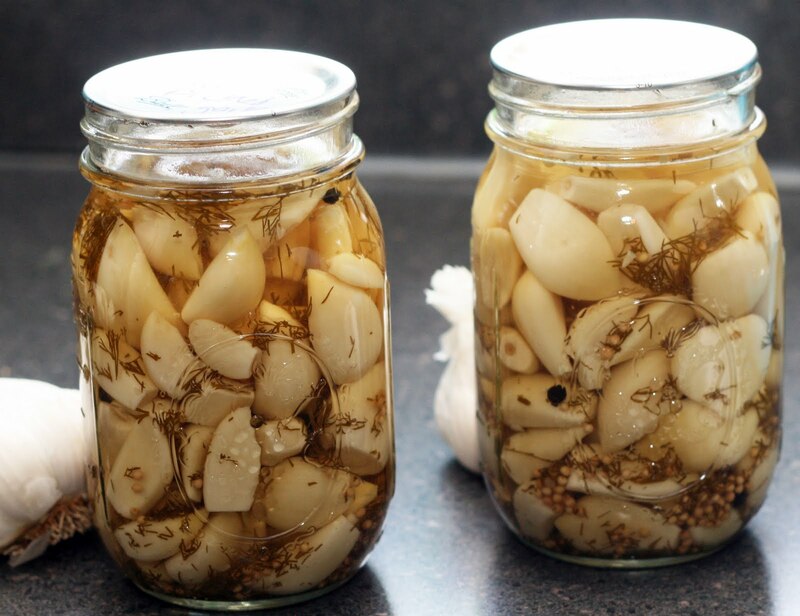 I had always scoffed at these (peeling garlic is easy!) but it was a lifesaver, peeling 2-3 cloves at a time. I suggest peeling while watching TV, perhaps True Blood. It goes much faster when you are distracted. Bring the vinegar, water and salt to a boil. Prep the lids/jars. Evenly divide all of the ingredients between 2 wide mouth pint jars Pour in the vinegar mixture. Close the jars leaving 1/2 inch headspace and process for 10 minutes in a hot water bath. Allow to sit 2 weeks before eating. I was pickling with my intern, Jillian, and noticed I had four zucchini in my fridge that I forgotten about. Since we had space in the canner, I quickly sliced them into planks and pickled them up. I used pretty standard pickle ingredients but gave them a touch of flare by adding some Old Bay. They are so crisp and spicy, they taste like summer in Baltimore. Place all of the marinade ingredients in a blender and blend until smooth. 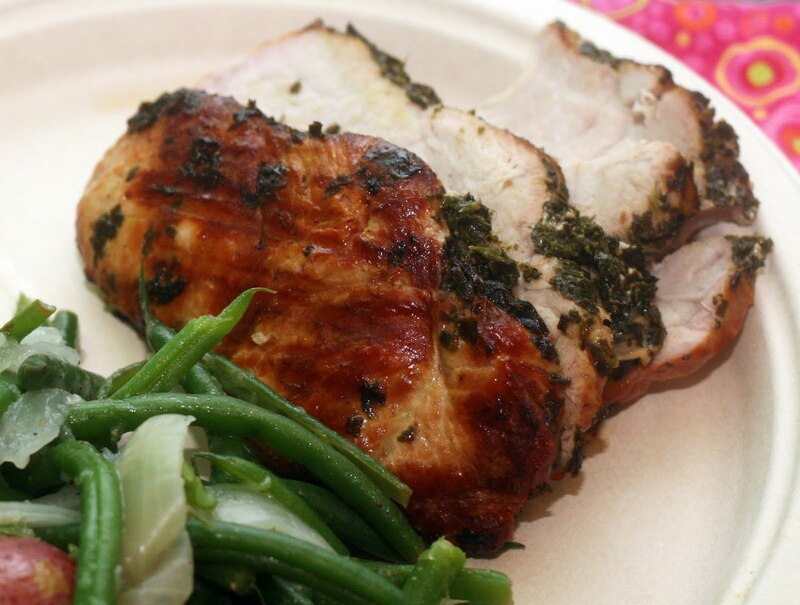 Add the pork and the marinade into a resealable bag or marinating container. 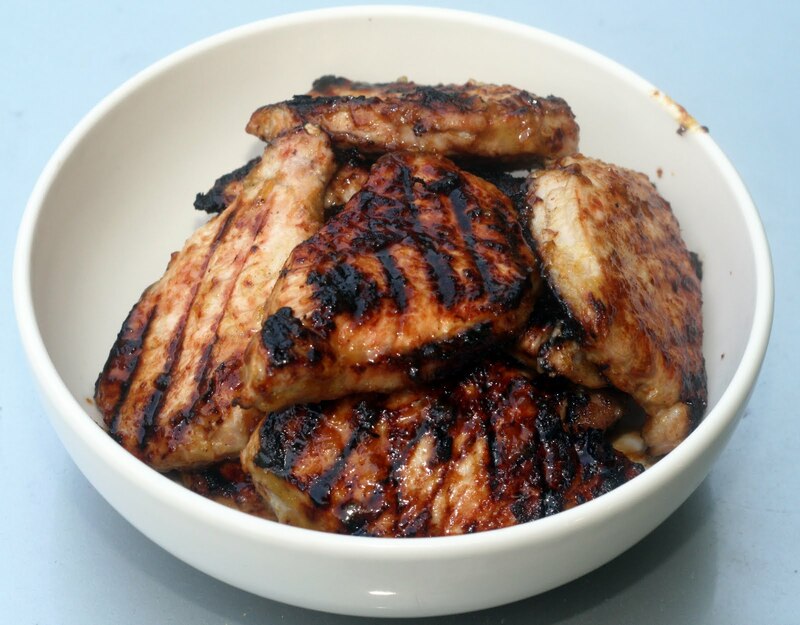 Allow to marinate at least 30 minutes and up to 2 hours. Prep your grill. 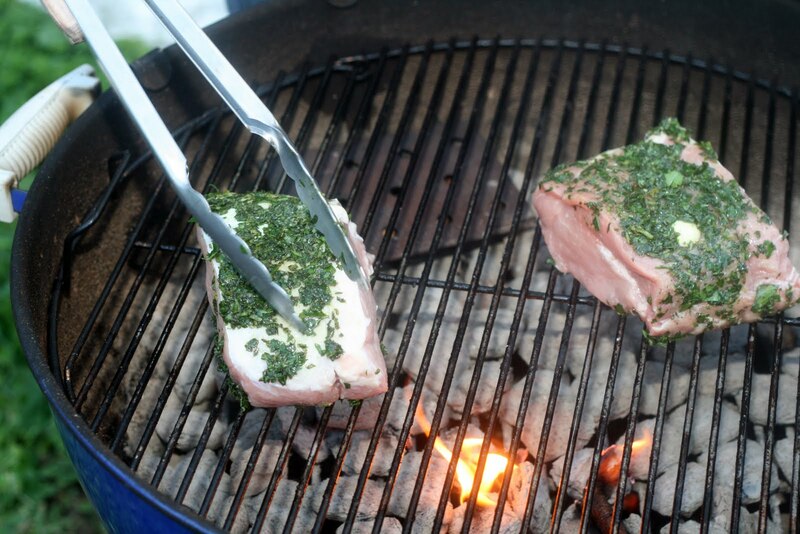 Cook the pork chops, flipping once and basting with lefter marinade as desired. Cook the pork throughly through. This is the ticket to super juicy pork chops and it couldn't be easier. The jam really seems to lock in the juices and helps the outside caramelize and get nice and crispy. The flavor permeated the pork in perfect balance between sweet and spicy and it the marinade took about 1 minute to pull together. One quick note, the recipe works well doubled, in fact in the picture I was testing it out as a double batch. Try it, you won't be disappointed. (and it is a great way to use up jam) I used my extra pork to make quesadillas the next day and they were excellent with a bit of refried beans & spinach. Place the peppercorns in tea ball. Place everything in a heavy bottomed pot. Stir. Bring to a boil. Reduce heat slightly and cook until thick, stirring occasionally and smashing up the apricots with the back of your spoon. Discard the peppercorns. When I spoted Black Velvet Apricots at the store, I had to have them. Black apricots! When I googled them when I came home, I realized that technically they were aprium, which made sense once I ate one. They were small like an apricot, the skin was a fuzzy black but the inside was closer to that of a plum than an apriot. So, so sweet and delicous. Yum! I had too many to eat before they'd spoil so I made this small batch of jam. It was pretty quick and easy because I didn't have to peel them or use pectin. 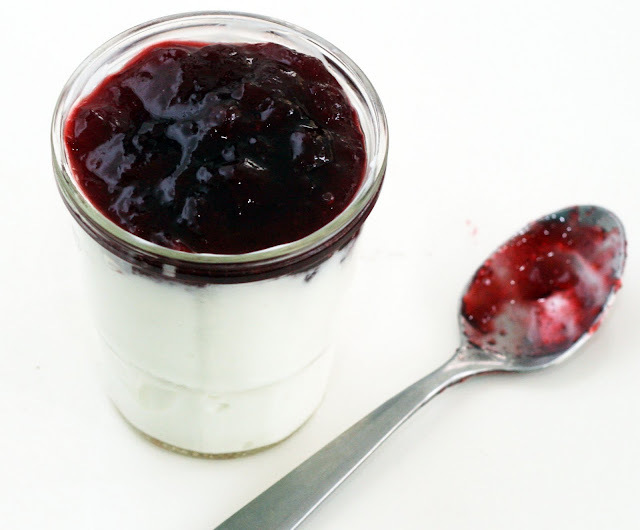 The skin just melted into the jam and it set up really nicely on its own. I added a bit of pepper for a hint of spice to counteract the intense sweetness which I enjoyed as sort of an afternote. It is really, really good on Greek yogurt. Place all ingredients in a lidded jar or dressing shaker and shake until well blended. It seems like pretty much any time I post a canning recipe I get a question about how we eat it all. Well, it is a combination of eating it as is, sharing with friends and using the jams, pickles and fruits in new ways and in other recipes. Plus canned food lasts a full year (or more!) so I have lots of time to use it up. I try to eat what I canned in the opposite season (I'm making sure at least a few jars of apricot, strawberry-rhubarb and raspberry jam make it to the dark days of winter and I've been enjoying the sunny orange jam I made in the cold weather) for the most part but there are no hard and fast rules. I don't let anything go to waste and lately I've been making small batches of more experimental or limited use items which is fun, quick and statisfying to make but doesn't overwhelm. Look for more of them over the coming weeks. Anyway! 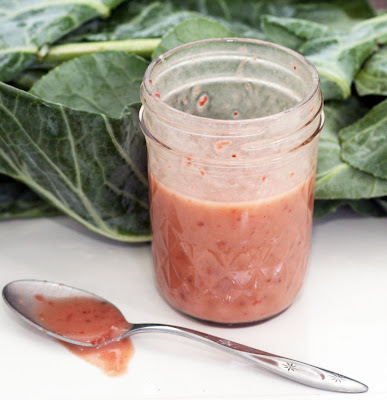 This jam vinaigrette is a great way to use up that last little bit in the jar (you can even shake it in the jar it is in!) or to introduce a little out of season (sadly, strawberries are a distant memory at this point) fruit flavor to your salad. In a saucepan, bring the broth to a simmer. Heat oil and butter in a large saucepan add the rice, garlic, salt and pepper and sauté for 2-3 minutes, stirring continually. 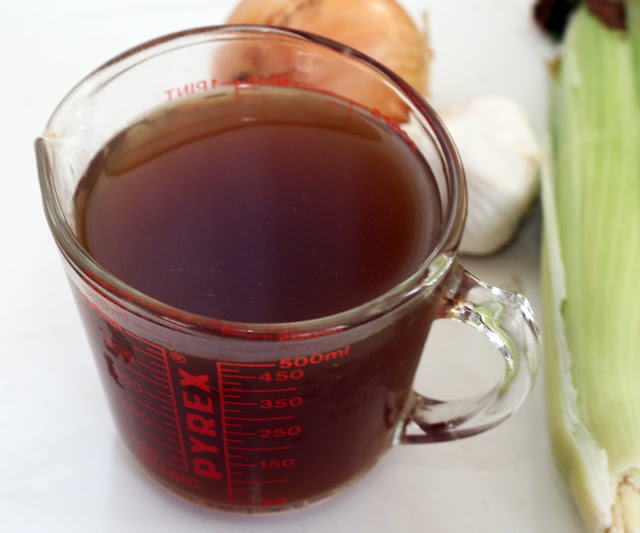 Add the broth a 1/2 cup at a time, stirring continuously, and waiting until the liquid is absorbed before each addition. Meanwhile, saute the mushrooms and spring onion in a separate pan until golden When you only have about 1/2 cup broth left, add it and the shrimp to the pan and continue to stir. 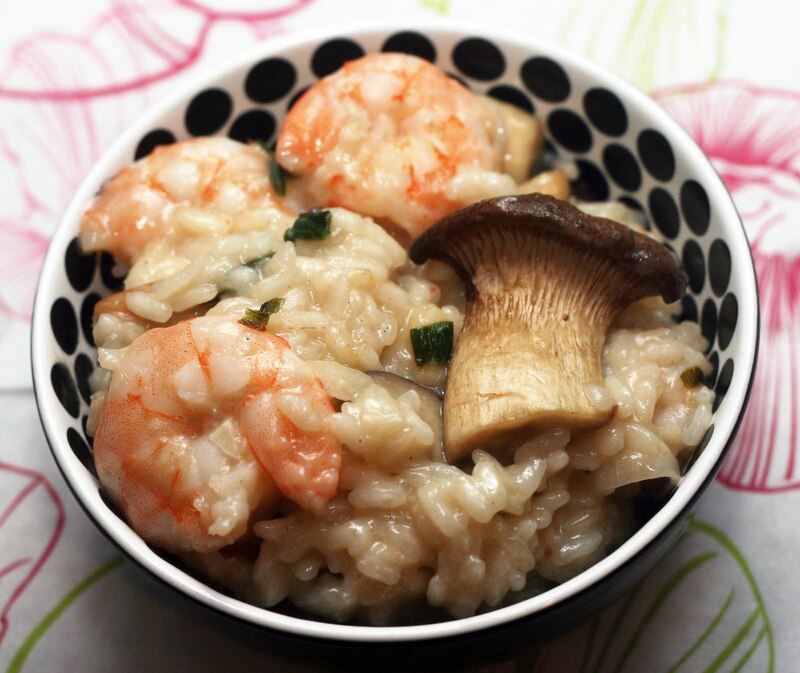 When the risotto is creamy and the rice is al dente remove from heat and stir in the Parmesan. Add the mushroom mixture. I am always happy to find king oyster mushrooms! 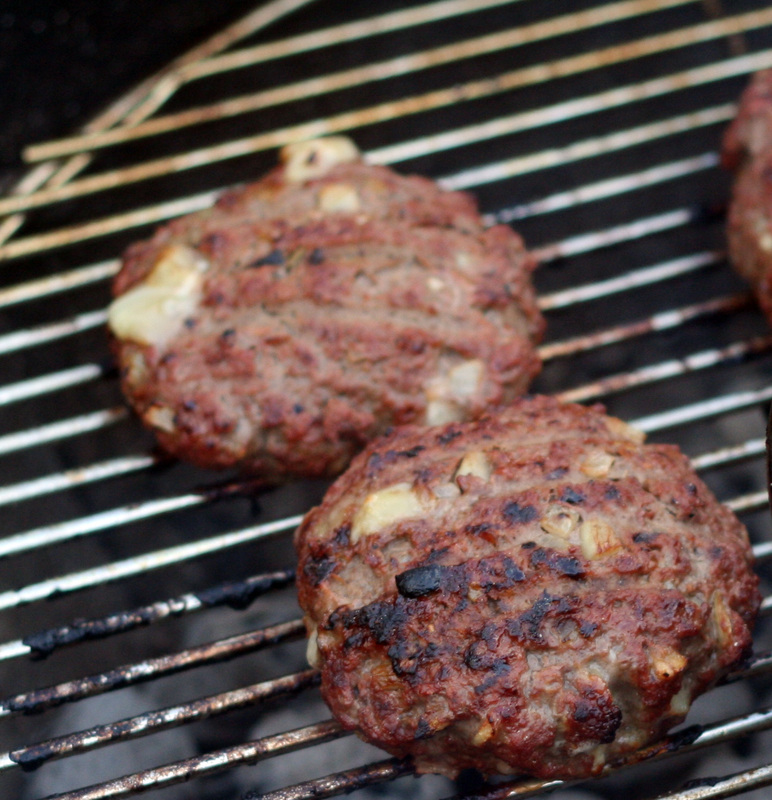 They are so meaty and flavorful you can do pretty much anything with them. Stir fry, grill, saute etc. For maximum flavor and texture I sauteed them separately and added them at the end of the cooking time. The result was a creamy risotto with lots of flavor and texture interest. Mash the berries in a large bowl with a potato masher. It should yield about 4 1/2 cups of pulpy berries. Set aside. Mash the peaches. It should yield about 2 cups of peach pulp. Add the sugar and pulps to a large, heavy bottomed pot. Prep jars/lids for canning. Bring the mixture to a boil. Boil for about 10-15 minutes or until thickened. Stir in the pectin and juices. Continue cooking at a low (rolling) boil for 5 minutes. Fill the jars leaving 1/4 inch headroom. Process in the hot water bath for 10 minutes. 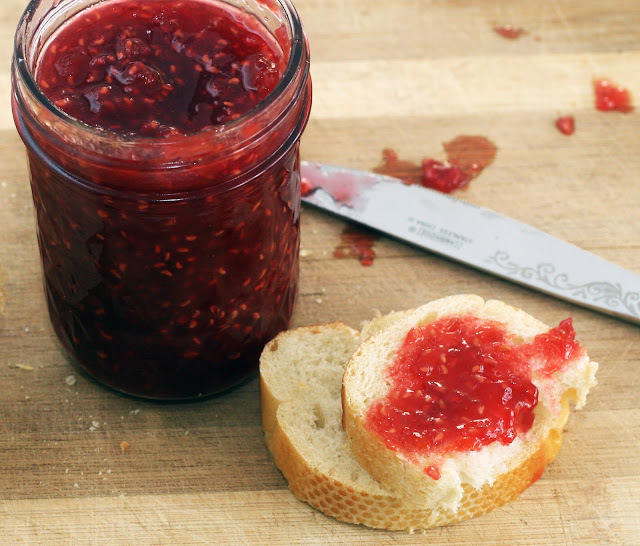 I am excited about this jam because so many raspberry and whatever jams are mostly whatever with a hint of raspberry. I love raspberries and really wanted to make a jam where it was the star, even if it was along side another fruit. I have to say, I think I hit the nail on the head with this one. It smells and tastes like the best raspberries ever but with a almost floral, honey note of peach. I could eat a bowl of this jam. Prep grill. Spray with nonstick grill spray or oil the rack. Place the oil, basil, parsley, oregano, salt and pepper in a food processor. Pulse until a paste forms. Set aside. Cut slits on all sides of the loin and insert a clove of garlic in each slit. Rub on all sides with the herb mixture. 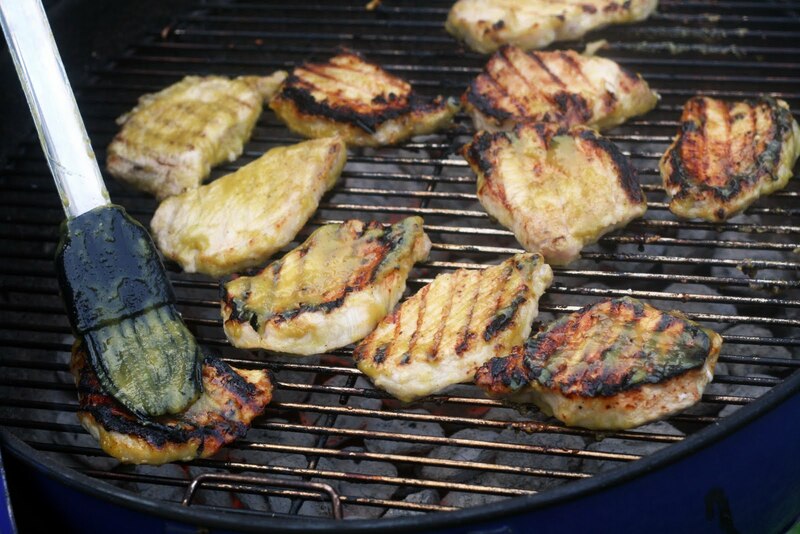 Grill until fully cooked, turning occasionally. I came up with this recipe to help use up the huge amount of basil, parsley and oregano our herb garden has been producing. It is a little overwhelming! Luckily, it made a lovely herby pesto type spread for the pork and really infused it with flavor. I cut my pork loin in two so I could have a whole piece for planned leftovers but this would work just as well as a whole loin. It was so juicy and the garlic added a lot of flavor. The leftovers make great sandwiches and panino. Whisk together the sauce ingredients. Refrigerate until use. Preheat oven to 350. In a medium sized bowl, add all of the meatball ingredients. With a gentle hand, combine all ingredients and form into 1 to 2 inch meatballs. Bake until cooked through, about 20 minutes. Meanwhile, place egg into a shallow bowl. Then mix together the matzo meal and the parsley in a second shallow bowl. Coat both sides of each eggplant slice in egg, then dip both sides in the matzo meal. Heat about a 1/4 inch of oil in a large skillet. I suggest coating all of the slices and stacking them on a plate so they are ready for frying before you fry your first batch. Fry each slice in the hot oil, about 3 minutes on each side, until golden. Saute the rapini, garlic and shallot in olive oil. *I make vertical stripes using the peeler, leaving some stripes of skin on. This seems like an insane amount of work for what is basically a sandwich but it is worth it, I swear. 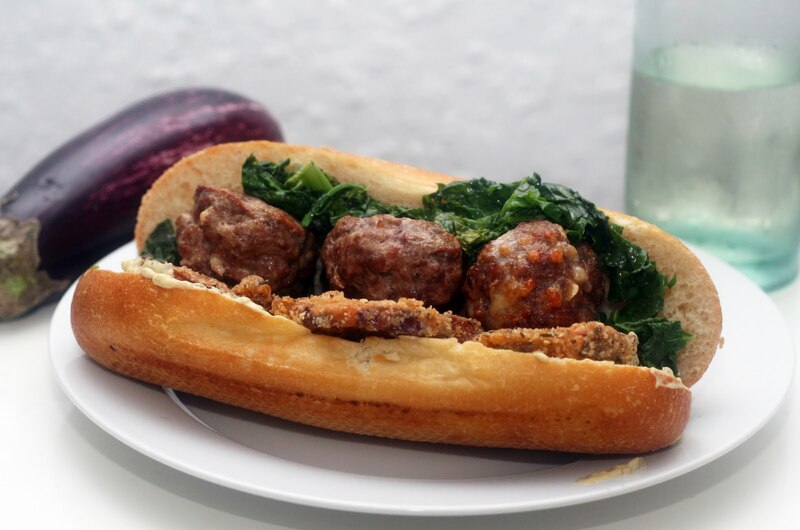 The meatballs bake for roughly the same time it takes to fry the eggplant so everything is hot, crisp and delicious at the same time. Everything just blends together into the best, most flavorful hot sandwich I've ever had.